This response is the result of collaboration with the 24 kinship care support groups from 23 Local Authorities in Scotland who are members of the Scottish Kinship Care Alliance, and the work of the Alliance’s policy team, made up of six kinship carers, alongside the Alliance’s Expert Working Group – four civic leaders in Scotland including Bob Winter (former Lord Provost of Glasgow and Director of Social Work), Anne Marie Peffer (Buttle UK) and Martin Johnstone (Chair of Poverty Truth Commission and Faith in Community Scotland). Our main concern with the proposed Secondary Legislation is the degree of Local Authority discretion on eligibility, assessment, and provision of support under the Kinship Care Order. As we have stated in previous responses there is quantitative evidence from the Buttle UK’s 2013 report ‘The Poor Relations’ as well as extensive anecdotal evidence from our wide network, that Local Authorities have in many cases attempted to do the minimum possible to support kinship placements despite Scottish Government guidance under GIRFEC which promotes kinship placements as the best and primary option for children unable to live with their parents. We propose to set out that a child should be considered at risk of becoming looked after if they meet any of the following criteria and if the local authority considers that the provision of kinship care assistance is necessary to prevent the child from becoming looked after. The latter (bold) part of the statement must be removed as it would enable Local Authorities a to with-hold support even if a kinship child met all of the eligibility criteria. We strongly believe, due to our historical experiences and the available evidence, that this loophole would be extensively used by Local Authorities. In the same section the consultation suggests that one of the eligibility criteria for support will be: The child has a recorded well-being need which could place them at risk of becoming looked after. Again there is too much discretion for the Local Authority to decide which ‘well-being needs’ could place a child at risk of becoming Looked After. The secondary legislation should specify which of the well-being needs, or how many, should be considered to confer eligibility. In the section on ‘When or how kinship care assistance is to be provided (section 73(3)(a) of CYPA)’, the consultation states that: Local Authorities may need to develop their own alternative types of assessment. Assessments for eligibility and need should be standardised and consistent across Scotland to prevent a postcode lottery of support. Section 2 on eligibility covers assessments in more detail. We are aware that there is a limited budget for the measures proposed (as laid out of the financial memorandum) and that concern about this was raised by the Stage 1 report and the finance committee. We are aware that due to the limited resources there is a perceived need to discriminate between those who are eligible and ineligible for support. With this in mind we have included a section on current best practice in Local Authorities and would suggest that the secondary legislation makes provisions to ensure this practice (on existing budgets) is replicated through other LAs. However, we also want to re-assert that the important and effective role of kinship carers in bringing up children who are not their own with the best possible outcomes should be recognised and supported to encourage more people to do the same. We strongly believe that if kinship care placements were recognised and properly supported, more family members would take up the caring role, reducing the cost and pressure on the residential and foster care systems. We also wish to stress again (as we have in previous responses) that children in kinship care have comparable needs to those in foster care (indeed, they would be in foster care if a family member had not stepped in). In addition kinship families are more likely to be on low incomes or below the poverty line than foster carers. Kinship Care placements therefore have equal and sometimes greater needs than their fostering neighbours, and should be universally entitled to basic supports (start up grant, full legal costs of applying for the order, psychological and educational services), with further supports available subject to eligibility. We wish to raise our objection to the use of Parenting Capacity Assessments to assess the eligibility and needs of children in kinship care. This is an invasive social work assessment, designed for parents who have, or are suspected of, neglecting their children. It is completely inappropriate for kinship care placements. We propose that the Child’s Plan assessment is instead used to determine eligibility and need in kinship placements. We would also strongly recommend that the Scottish Government replicates the comprehensive list of factors which should be taken into account when assessing need for support in the Adoption Support Services Regulations 2009. It is important that the proposals separate the need for different types of assessments. An assessment to establish whether the placement is appropriate will be carried out as part of the application process for a section 11 (Kinship Care Order). We agree that an assessment of need for support should be included at this point, however, if a carer requests an assessment of need later on in the placement, this should be a simple assessment along the lines of the Child’s Plan assessment, which does not again ask probing questions about the suitability of the placement. Many kinship carers fear that assessments will result in the children being taken away from them due to factors like their age (as most are grandparents) or the fact that they smoke. It is crucial that there is good communication and transparency when assessments take place to ensure carers are aware of why the assessment is happening, what it will entail, and what the possible outcomes will be. We are concerned that the use of Free School Meals entitlement as means testing for supports such as the start up grant, help with legal costs and help with transport costs will exclude a considerable proportion of kinship carers who would otherwise experience financial hardship. Firstly, as previously mentioned, it is our firm belief that all kinship carers should be entitled to these basic supports, in particular the start up grant and legal costs. Secondly, entitlement must not be limited to those in receipt of Free School Meals. In a survey at our recent Alliance meeting, only 27 out of 37 carers were eligible for free school meals. An extra two received Pension Credit (which should also confer entitlement to support), but seven others received neither and still considered themselves in financial difficulty and struggled when the children in their care were placed with them. Thirdly, it is important to consider at what point in the placement means testing is carried out. Many kinship carers try to remain in employment when they first start their caring role, but often find they are unable to hold down their job after a while. Therefore kinship carers should be able to request re-assessment at any point in the placement if their circumstances have changed. We agree with the consultation that: ‘the assessment should take place within a specific timeframe’, and suggest that the four week deadline under the Adoption Support Services Regulations 2009 would be appropriate. We also agree that ‘the local authorities [should] notify the qualifying person of the decision whether to provide kinship care assistance and reasons for it’. This should also be time limited. We would suggest the carer should be informed of the result one week after the assessment is carried out (ie no later than 5 weeks after they request assessment). 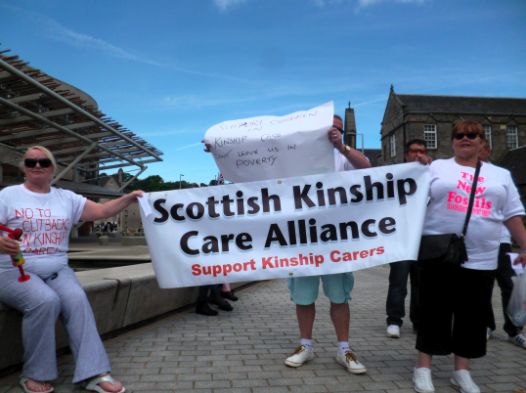 We are concerned that the ‘description of kinship care assistance’ does not include certain crucial services and forms of support which the Alliance among others have long campaigned for, and that the types of assistance which are suggested will only be available to a minority group of kinship carers due to unfair and artificial eligibility and means testing criteria. 3.1 We are extremely concerned that there is no provision for psychological and educational support services for children in kinship care. The majority of kinship children experience separation anxiety, attachment disorder and other syndromes exhibiting themselves as behavioural problems. Evidence1, and Scottish Government policy, suggest that early intervention is key to minimising the impact of these issues on the child’s life chances. We would suggest that ‘information, advice and counselling‘ includes signposting kinship carers to specialist educational and psychological services in their area. Where these services do not exist the Scottish Government should fund an extension of existing services, where possible trained by the best existing services (e.g Circle, FASS Glasgow, Notre Dame.. see section on best practice). 3.2 We are also concerned that there is no provision for respite services for kinship carers. Again, any existing respite services should be signposted and further provision funded in areas where it doesn’t exist or is not sufficient. It is essential that new kinship carers are made aware of what their entitlements are, and what services they can access. Many kinship carers currently miss out on services and support which already exists in their area because they are not aware of it. ‘Information‘ for new kinship carers should take the form of a comprehensive pack, containing a right-based guide to entitlements under the Kinship Care Order, and signposting to relevant local services and kinship support groups. This pack should not be delivered by the social worker or social work department overseeing the placement, but by an independent department of the Local Authority, or by the dedicated kinship care social work team (see below). Many Local Authorities now have a dedicated kinship care support worker, overseeing a team of two or more social workers who are trained in specific issues associated with kinship care placements. Kinship carers in these LAs have a better chance of accessing appropriate services and support as they have an advocate in the social work department. This practice should be rolled out across all Local Authorities and could be included in the secondary legislation. We consider it essential that help with the full legal costs of applying for a Kinship Care Order should be covered in all cases. Many kinship carers in our network are already in up to £4000 of debt because of court costs relating to obtaining a stable legal order for their kinship arrangement, and others have been unable to apply for orders because of the financial cost, leaving them without even the most basic support. We consider it essential that the start up grant of £500 is available to all new kinship carers to cover ‘the essential start-up costs involved with having a child come to live with you’. We are not in favour of means testing this support because: a) the vast majority of kinship carers are in a low income bracket and would struggle financially to meet these unexpected and often sudden costs, and b) start up grants should be considered a basic form of support which can help encourage family members and friends to take up the caring role, reducing the burden on the foster and residential care systems. Secondly, it is very important that start up grants are made available as soon as the placement begins are not delayed by assessment, means testing or any other bureaucracy. Start up costs are immediate, and when grants are not provided immediately kinship carers are likely to take loans or use credit cards to cover these costs, creating further problems and exacerbating stress. We note that the consultation states: ‘For those who are eligible, below are some suggestions about what kinds of assistance should be available’. We are concerned that the legislation should prescribe the basic forms of support which should be available to all kinship carers in receipt of a Kinship Care Order, as well as those which will be available depending on eligibility, and not leave this open to local interpretation. We remain very concerned that the report is yet to be released nine months after it was due, and there has been no attempt to integrate the findings into the secondary legislation. As a result there remains no assurance that there will be any financial support whatsoever available for those in receipt of a Kinship Care Order, let alone measures to address the inconsistency and postcode lottery of support which the review was set up to examine. The failure to release and integrate the conclusions of this review leaves us unable to comment on a key form of support which, in ours and the Education and Culture Committee’s view should have been included in this legislation. We look forward to release of the review’s conclusions asap and hope that provisions are being made so that the new measures can be integrated into the Act before it is passed by parliament. This section lists some of the best current examples of ways in which Local Authorities are using their existing budgets and resources to provide effective support services to kinship carers. These models should be shared and rolled out across Scotland wherever possible. Where local services do not exist the Scottish Government should fund extensions of existing services or the setting up of new services, where possible trained by the best existing services available elsewhere. Glasgow Social Work has developed an excellent relationship with kinship carers by holding quarterly multi-stakeholder meetings with members of the four Glasgow kinship support groups. The meetings enable kinship carers to raise their concerns with, or give feedback on, services and provision, and social work to respond and adapt their provision. Kinship carers feel the meeting have been useful and the service has improved. Glasgow social work do not discriminate between section 11, Looked After, or informal kinship carers in their allowances. All kinship carers who have had an involvement with social work get £50/week. This has been possible due to an extension of funding by Glasgow City Council, and by re-prioritising of the whole social work budget. Glasgow has made good use of section 22 budgets to give extra birthday and christmas money for each child in kinship care. Glasgow social work also recognise the value of kinship care support groups run by kinship carers and fund each local group annually according to the number of children represented. FASS Glasgow is an addiction support service for families and provides space for kinship support groups to meet as well as supporting them via Grand Week – a week celebrating grandparents contribution to bringing up children, and a variety of other funded programmes. Notre Dame is a child therapy centre specialising in kinship care children. Over several decades they have developed a unique understanding of the emotional and behavioural difficulties commonly affecting kinship children. They are funded by the Local Authority as well as other sources and deliver 6 week therapy for all children in kinship care (no referral necessary). This service has been life saving for many struggling kinship families. North Ayrshire social work have an effective dedicated kinship care social work team made up of a team leader and two workers. In conjunction with the team they have developed a fairly comprehensive information pack on entitlements and services for new kinship carers. North Ayrshire also make good use of the section 22 budget to support kinship carers without it being clawed back by benefits assessments. West Dunbartonshire has a good joined up and tiered approach to accessing services, sharing information between health boards, education and social work. Development of the Brain: How “States” become “Traits” ‘. Infant Medical Health Journal. Vol 16, No 4.